I usually don’t quote French people. I like this quote. It injects some humility back into me. I’ve been on my high horse lately, about how I’m overburdened by my boss and my family. Like I shouldn’t have to work or something. It tracks back to the book: I very naively, very self-centeredly, assumed this whole publishing thing was just getting up the courage to send something in. I keep being surprised – unpleasantly, obviously – by the rejections. Go with me in my mind, if you will, to this nice spot where three or four literary agents of high standing are having a bidding war for the right to represent me. My work back here in Colombia would be, in a situation like that, sort of a giddy fun thing I could take or leave. Where did I get such hubris? Mom didn’t raise me to be like this. Then again, maybe I needed the chutzpah just so I would DO it – if I had known how hard it would be, and the unlikelihood of success at least right off the bat, maybe I would have quailed a long time ago. I don’t think I’m constitutionally so strong that I’d be immune. In fact, it took me years to finish the book and send it in, even living in my fantasy world about publishing. 1. No literary agents are, as yet, fighting over the right to represent me. 2. In fact, of the fifteen I sent queries to, I have received about 8 rejections. I say “about 8” because I keep avoiding the spreadsheet where I put them, so I don’t have an exact figure. 3. I feel paralyzed when I even think about returning to the query letter, the book, or, even, the cute office I set up for my authordom. I’m sure it’ll all calm down soon. I’ll go back to it, make another effort, learn from that, try again, and on and on. It’s not just selling a book, anyway. I can actually just be happy I wrote a book, even if it’s never published. Besides, nobody promised me an easy ride. 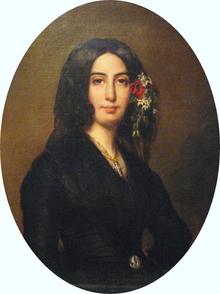 George Sand had it exactly right.